This one has been on FamilySearch for a while–not certain how many counties have been added. 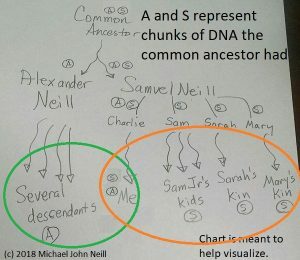 Genealogy Search Tip of the Day is sponsored by GenealogyBank.com–search for your ancestors today. This entry was posted in Uncategorized and tagged familysearch on October 1, 2016 by mjnrootdig. 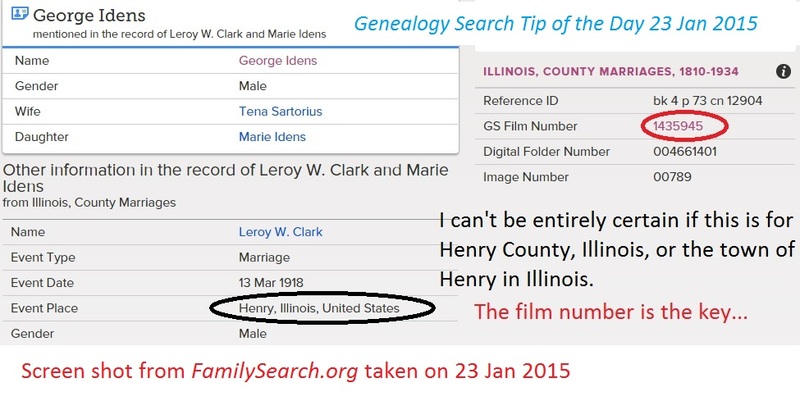 A search of the “Illinois County Marriages” on FamilySearch located a reference for Leroy Clark and Marie Idens[sic] marrying in “Henry, Illinois, United States” in 1918. The problem was that I was not certain if the marriage took place in Henry County, Illinois, or the town of Henry, Illinois. The answer was there in the GS Film Number: 1435945. Searching the card catalog for that film number indicated that the marriage entry was taken from Henry County, Illinois, marriage records. That would also be the film that has an image of the actual marriage item from which this index entry was created. If an index entry on FamilySearch is unclear, search the card catalog for the roll number from which the entry was made. That will make things more clear and tell you where you can get the actual record. This entry was posted in Uncategorized and tagged familysearch on January 23, 2016 by mjnrootdig.